Beyond the rectangle. Dive into these unique pool shapes and designs. According to pool designer Ryan Hughes, “Shape is one of the first fundamental design decisions that needs to be made.” Though rectilinear pools have taken center stage for nearly a decade, there is a budding trend toward free-form shapes. Designers note the flexibility and creative freedom inherent in more organic forms, often described as relaxed, social, friendly, and inviting. So how does the curvilinear pool measure up? We’ve asked four industry pros to share a project illustrating the form’s versatility and staying power. Don Goldstone, owner of Los Angeles-based Ultimate Water Creations, describes a project located on a small lot in North Hollywood. “It’s a completely naturalistic, free-form pool with many ins and outs that make it look like a real pond,” he says. Goldstone’s signature artificial rocks line the entire perimeter and reach into the pool itself. He feels strongly that his reinforced solid concrete stonework plays a key role in creating an effective naturalistic setting. He enhanced the free-form shape with planter pockets that can be watered, drained, and lit without disturbing the plants. 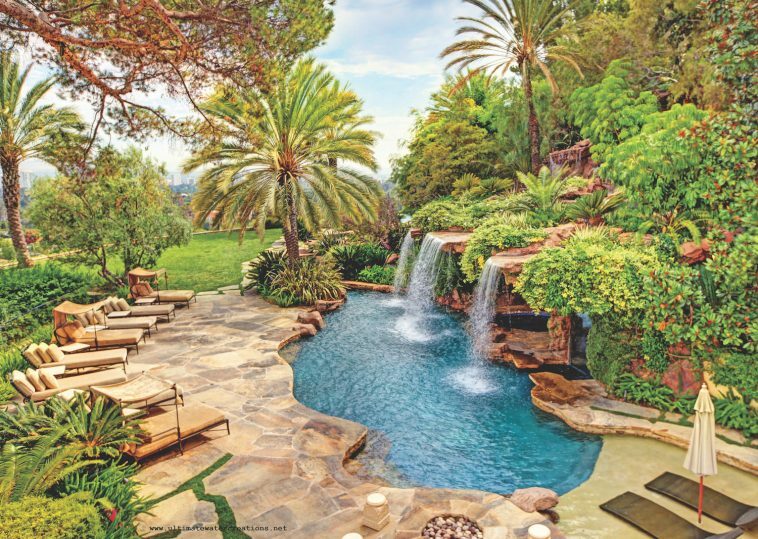 Though space was constricted, Goldstone managed to add a spacious 32-foot-long gunite pool with multiple waterfalls, which are heated to 100 degrees. One waterfall cascades over the spa, creating a hot shower effect that doubles as a massage opportunity. Other design elements include a covered patio, elevated deck, uplighting for a nighttime waterfall display, and superior finishes, such as the interior glass bead by Pebble Tec chosen for its resistance to fading and discoloring. The exterior finish, a combination of natural flagstone and cobblestone, ties in with the house. All pool equipment is located behind the spa and waterfall grotto area for soundproofing, plus quick and easy access. 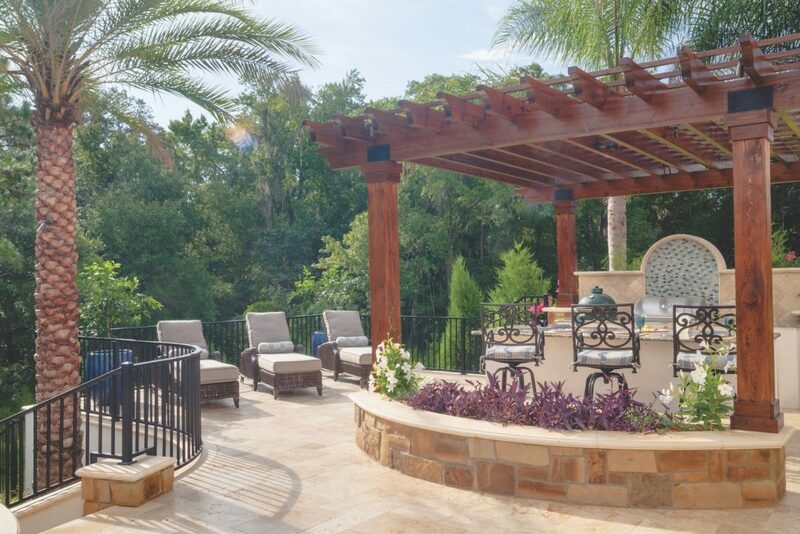 The clients’ wish list included a fireplace and seating area in a more traditional style, as well as a columned pergola over an outdoor kitchen with ambient and direct lighting. They also decided to include a decorative tile gas fire feature. Hughes incorporated curvilinear areas to bring in “a bit of true geometry,” so the project wouldn’t be amebic in shape. According to Hughes, the challenge was making linear and biomorphic styles work together. Because the home’s backside is one straight line he felt he couldn’t add a completely free-form pool without sacrificing continuity. Hence, the kitchen/pergola area and sundeck mirror the lines of the house. Marble tiling and cast-aluminum cushioned seating by Castelle help to unify the sprawling outdoor living area. The custom spa and infinity pool are finished in Blue Sapphire glass tile by Ezarri Mosaico (imported from Spain and made from recycled windshield glass), while the pool’s dark bottom is Pebble Tec’s Ocean Blue. “We wanted it to feel like a natural body of water flowing out into the reserve behind. It almost feels like a natural pond,” notes Hughes, who used an ashlar-patterned stone veneer on the spa and fireplace to deepen the naturalistic impression. A bench runs the entire perimeter of the pool so occupants can move with the sun (or find shade), and a palapa on the backside covers the dining and living areas. Sited by the vanishing edge, the spa takes advantage of magnificent sunset views. Cobalt blue mosaic tile matches the colors of the Caribbean Sea. An artificial stone retaining wall planted with tropical plants prevents soil erosion on the steep grade, contributes color and regional identity, and acts as a barrier to mitigate the sounds of social time in the pool. Ed Gibbs of Ontario-based Gib-San Pools notes the last decade’s emphasis on rectilinear pools in North America and finds the move toward free-form refreshing. “The rectilinear shape doesn’t always work—topography and site elevation as well as architectural style of home might call for a less rigid shape,” he says. This project, located in Toronto, is one such case. With it, Gibbs blended together linear and nonlinear forms and styles—an approach to design that he believes is gaining favor. The house is elevated, and Gibbs addressed the grade change by terracing the landscape. As it also backs up to a golf course, he kept the plantings simple so as not to interrupt the manicured look of the course. “We wanted to have that country feel,” he notes. In keeping with the trend toward clean colors, Gibbs went with white tile and a white Pebble Tec interior finish. “Those choices brought a [crisp] look to the yard even with the pool’s curvatures,” he says, noting how the curves of both the pool and the fountain harmonize with the surrounding landscape. Additionally, the decision to use horizontal rather than vertical boards for the privacy fencing helped add atypical structure to the surrounding organic forms. Color, together with square-cut stone decking and a rectilinear fire pit, visually tie the pool and outdoor living area to the modern-style house.